Switch up the mood in your next marketing campaign with this classic item. The 24 oz. 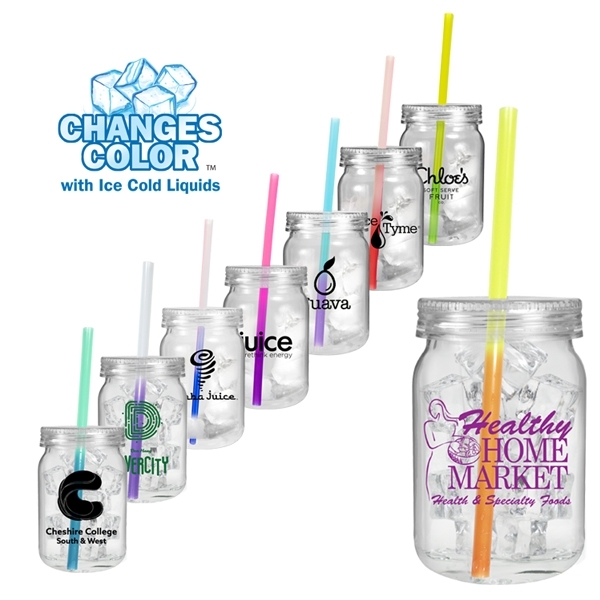 Plastic Mason Jar is BPA free and features a single wall design with a lid and an unimprinted, heavy duty plastic mood straw. This colorful straw changes color with ice cold liquids. Add a custom imprint of your company name or logo and hand out this fun promotional giveaway at bars, restaurants or parties. Order yours today! Ship Weight:Must be ordered in full carton quantities. Lids & straws are shipped unassembled in same box. Boxes are subject to "Dimensional Weight" charges.